Among the distinct features of Kent Station, Cork city’s train station, is this section of wall which is jam packed with so much stuff: functional and cultural, pragmatic and odd. My interest with this small space, which prompted me to take the photo, highlights the role of basic observation in not only research but in our daily lives. 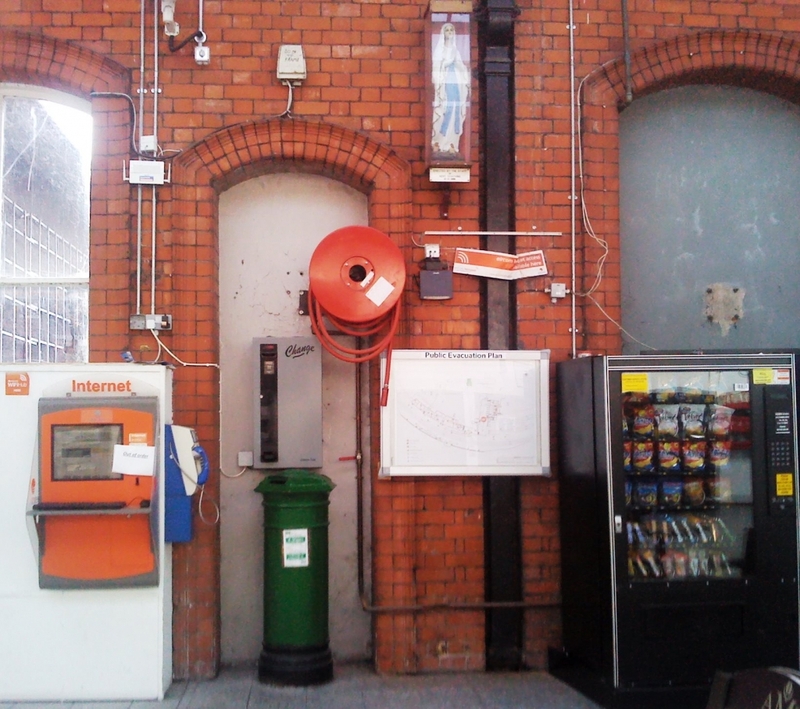 A side interior wall of Kent Station, Cork. the arches and drain pipe (the Station is a pro-typical old train station in many ways, with high pitched roofs, long platforms and ornate red-bricked walls; although, the main platform is curved making it rather distinct). Although this wall-space is a noteworthy thing to write a short blogpost on, the greater point is the importance of observing the world around us. The world is generally filled with things ready to be noticed and appreciated. Observation was one of the primary skills emphasised in my geography undergraduate courses. It is in truly engaging with the world around us that we can understand it and be motivated to preserve, change or improve it, as required. A good example of this is in an episode of the podcast 99% Invisible (it explores architectural ideas in a very interesting and insightful way) which highlights the great many public staircases in California. It shows how these fascinating features are generally unknown and under-used; how they can be discovered and explored with enthusiasm; but also, how they can be blocked by private interests and re-opened by committed activists. Ultimately, while observation is an essential research tool, it is also a duty of the citizen more generally to be observant. Take in what is going on around you, be involved in the world. While the commuters, tourists and people of Cork pass by the wall-space the eclectic collection will remain, or maybe not, have you noticed? One of the elements of geography that I really like is its implicit focus on exploration. It is based on a fundamental desire to understand the world around us, how it functions and how we interact with it. While in academic terms, this process can be most professional and complex, the core ideas are accessible to all. Particularly, in the ways we can all explore places. All places, even everyday normal places, are filled with interesting elements, awaiting discovery. It is relatively easy for anyone to start thinking ‘geographically’ and begin exploring places. For example, urban areas have architectural features, especially above street level, which we rarely see, or how many streets do we walk down without knowing there names, or what/who is that monument dedicated to? ; while rural areas have a multitude of rich hidden aspects, including rarely travelled roads, wildlife and rare flora, and antiquities. I would encourage everyone to engage with their local places and landscapes, to seek out the multitude of features, to appreciate their worth and to tell others. This exploration can be a purposeful encounter, or it can be something you incorporate into your routine. The important thing is that we carefully consider the world around us, in all its richness. Observing an urban space: Find a spot you can comfortably sit or stand and observe for about 15 mins. Remain relatively stationary and look at everything that is around you (the physical and human-made landscape) and all that is happening around you (activity, weather, movement). After a few minutes, you will notice things you’ve never seen before; they’ve always been there, you just didn’t notice. Re-routing: Try and take a different route than you normally would for a journey. We all get so used to travelling certain ways and can forget about streets and passages which may be different or even slightly longer, but may be more pleasant or may even prove to be more efficient at some times! Who’s about (and who’s not): When you’re moving around – out shopping, at work, in school, socialising – look at who is around you? Is it all people your age? People from the same area as you? People who look, move and act like you? Are there more or different people? If not, why not? Visit your place: Be a tourist for a day. So many of us have never been to the main tourist attractions in our own cities! Take an afternoon to visit that place, check it out. Placehaking or Urban exploration is a research type, a hobby and an interesting feature of contemporary urban living. It involves ‘recreationally trespassing’ into derelict sites, or, as they can be called, T.O.A.D.S. : temporary, obsolete, abandoned or derelict spaces. Bradley Garrett, who completed his PhD thesis on urban exploration in the Department of Geography, at Royal Holloway, University of London, is among the foremost proponents of Plachacking. His excellent blog Placehacking illustrates the richness and insight which this activity offers. Furthermore, the blog shows how the integration of different media can offer a fuller experience of place on line. Promise of Place: A document that offers tips and techniques for exploring place, from Promise of Place, a place-based education organisation. National Geographic’s Guide to Mental Mapping: How to use mental maps to organise information about people, places, and environments in a spatial context. I listen to radio frequently, with one always on at home and when I drive. I also listen to many podcasts, mainly as I walk. I subscribe to different shows, some of which are radio station content that is recorded and made available for download and others which are exclusively produced as podcasts. Form a geographic perspective, I am struck at how radio shows and podcasts can convey a very rich sense of place. I feel that podcasts/radio are powerful and under-appreciated tools for describing the world. The limitations of the medium require presenters, reporters and producers to compensate by combining thick description with high-quality sound recordings. Podcasts, and audio more generally, can play a significant role in exploring, understanding and presenting places. I’ve chosen three examples to illustrate this point. The first, is an episode of the NPR programme Hearing Voices, which is a weekly show that presents a series of segments, mostly collected from radio broadcasts, documentaries, podcasts and found-sound, relating to a single theme. The episode, Sacred Places (HV079), presents a selection of short pieces that really capture the essence of the places, and the people and practices involved. You can experience the Hindu holy city, Vrindavan through ‘talking notes’ and a the background track of the ambient sound, and get a sense of a Lutheran Church in Montana through an interview intermixed with sounds from services at the Church. It is a really fascinating episode, which I find myself returning to time and time again. The Royal Canal is a beautiful piece that uses the qualites of good radio/podcasting to portray a journey down a waterway. It is an episode of the Curious Ear, a short radio documentary series that is produced by RTÉ Radio 1, the Irish national public broadcaster. It features “Six miles of canal; six miles of stories”, as it follows the presenter/producer Ronan Kelly as he canoes along the Royal Canal in Dublin city. The use of recordings of the water and paddling is particularly evocative. This final example is more meta, in that it is a podcast that is about making or understanding/analysing radio and podcasts. How Sound is a very interesting short show, from PRX, the Public Radio Exchange, that explores the world of audio and radio/podcast making. The episode, Show, Don’t Tell, looks at how sound and recordings can be effectively used to demonstrate a topic to listeners, such as recordings of the presenter walking waste deep into ocean water and the difficulties of a man in a wheelchair trying to exit his car in an unsuitable disabled parking space. Radio, podcasts and the use of audio more generally raises questions about how researchers present their work, especially geographers. Ultimately, most academic work is conveyed in text, which is supported, sometimes, by illustrations, diagrams and maps. However, audio is rarely used. The potential that it offers is considerable, especially in examinations of place. In my research, I frequently make audio recordings, even if it is just of the ambient sound. The use of such recordings are an important component of my methodology, which tries to gain a deep appreciation of the places being studied. I would encourage other researchers to consider the role that audio can play in their research.